“Pride (In the Name of Love)” was the first single released from 1984’s The Unforgettable Fire album. The lyrics were inspired by Dr. Martin Luther King, while the music was initially developed during a sound check in Hawaii during The War Tour and later completed during The Unforgettable Fire sessions at Windmill Lane Studios. The song credits backing vocals to Ms. Christine Kerr, who is more commonly known as Chrissie Hynde of The Pretenders. (She was married to Simple Minds frontman Jim Kerr at the time.) The song includes an error in the lyrics, when Bono sings “Early morning, April four, a shot rings out in the Memphis sky…” In reality, Dr. King was shot in the evening, not the early morning. This error would be fixed in a 2012 re-recording of the song by Bono. “Pride (in the Name of Love)” quickly climbed charts worldwide, and became U2’s first top 40 single on Billboard‘s “Hot 100” chart in the USA. The song would also be their first #1 in New Zealand. In Ireland, “Pride” was the third single in a row which just missed the #1 spot, charting at #2. In this case, “Pride (In the Name of Love” was kept out of the number 1 spot by “I Just Called to Say I Love You” by Stevie Wonder. The single was issued worldwide by Island Records or companies with ties to Island, except in Ireland, where U2 was still under contract to CBS Records to release singles. Interestingly, the single version of “Pride” is longer (4:40) than than that found on the album (3:48), in contrast to the more common practice of taking a longer album track and editing it down for radio play. The 7-inch vinyl is backed with “Boomerang II,” an outtake from the recording sessions for The Unforgettable Fire. The 7-inch sleeve features a black-and-white photograph of the band, framed by a thick white border. A limited 7-inch picture vinyl was also released in the UK, with a large photo of U2 on one side, and smaller individual photos on the other. A double 7-inch vinyl version of the single was also issued to the UK market. 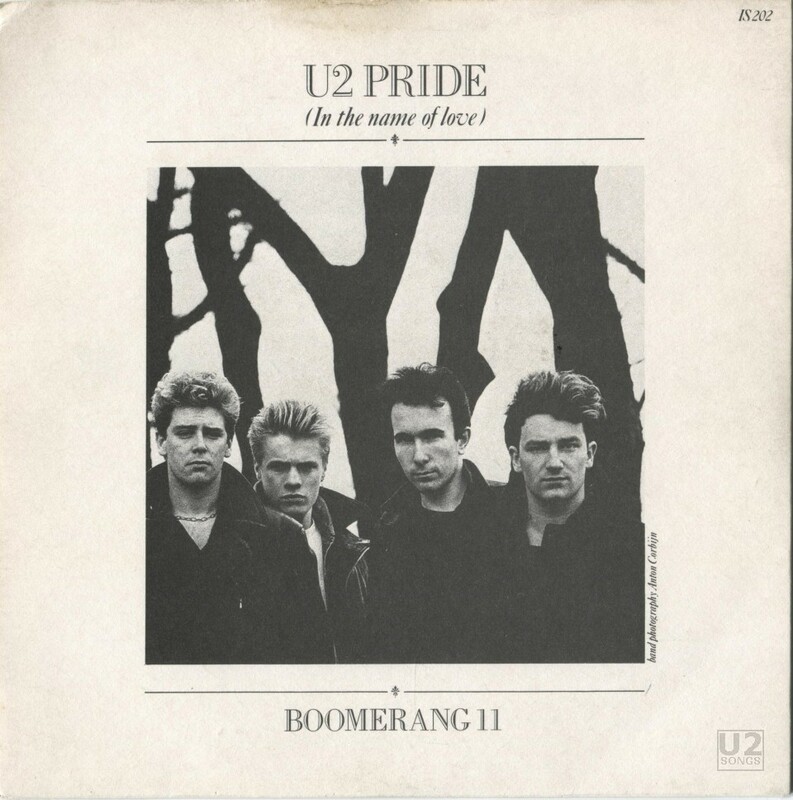 In addition to “Boomerang II,” it included “Boomerang I” (an earlier, and primarily instrumental, take of the song), as well as a version of “4th of July” that is longer than the version that would be released on The Unforgettable Fire. The track listing and cover art for this double 7-inch release was later used for the 1991 Austrian pressing of “Pride” on CD. A number of countries also pressed a 12-inch vinyl with the white cover containing this track listing. Australia also produced a cassette single using the same ingredients. A second 12-inch was produced in the UK and Spain, featuring the same basic design on the sleeve, but with a wide blue border replacing the white. This format featured a slightly longer version of “11 O’Clock Tick Tock” than had been previously released, along with “Touch” from the “11 O’Clock Tick Tock” single and the two versions of “Boomerang.” The blue version of this 12-inch single was also released in Japan, while Canada and New Zealand issued it in cassette form. Finally, a unique version of the single was released on cassette in the UK. It featured the band photo stretched to fill the entire cover in black and white, with a small blue square laid over the image with the title. This format contained the two versions of “Boomerang,” the longer version of “4th of July,” and added one additional track, the non-album single “A Celebration.” Despite errors over the years declaring this to be a live recording, it is, in fact, the same studio version of “A Celebration” that had been originally issued in 1982. Three videos were filmed for the single, the first of which is known to exist in at least two versions. It was directed by Donald Cammell in August of 1984 and produced by James Morris and Michael Hamlyn. It depicts U2 performing in St. Francis Xavier Hall in Dublin, Ireland. The opening and closing shots offer a view of the Dublin Docklands area from the air, including the power stacks of the Poolbeg Generating station, which ceased operation in 2010. Two versions of this video exist, the more common of which which is treated to look “sepia-toned” throughout. The rarer version is in full colour. The sepia version was featured on The Unforgettable Fire Collection video release, the U218 Videos and The Best of 1980-1990 compilation videos, and the bonus DVD accompanying the super deluxe reissue of The Unforgettable Fire. A second video, directed by Barry Devlin and filmed in the spring of 1984, features performances of U2 shot at Slane Castle during the recording of The Unforgettable Fire album. This second version was also featured on The Unforgettable Fire Collection video, the U218 Videos compilation, and the DVD accompanying The Unforgettable Fire reissue, as well as on the Go Home: Live from Slane Castle release. A third video was directed by Anton Corbijn—his first for U2—and features the band members’ faces in and out of focus against a grey backdrop. This third version was rarely seen compared to the other two much more popular videos. It has not featured on any commercial release from the band. “Pride” has been a staple of most of U2’s live sets since it debuted in 1984 on The Unforgettable Fire Tour. It was played nightly on that outing, as well as on The Joshua Tree, LoveTown, Zoo TV, and PopMart tours. During The Elevation Tour, it was played frequently, but not every night. During The Vertigo Tour it was once again performed at every show, while during the U2360° tour it made the set for just over half of the shows. During the Innocence and Experience show, “Pride” was performed every night on the first two legs of the tour. It also was performed every night on The Joshua Tree 2017 tour. Live performances of “Pride” have been released in audio format on Live from Paris (July 4, 1987, Paris France); Rattle and Hum and the multi-artist compilation Rainbow Warriors (November 8, 1987, Denver Colorado); Love: Live from the Point Depot (December 31, 1989, Dublin Ireland); Zoo TV Live (November 27, 1993, Sydney Australia); Go Home: Live from Slane Castle (September 1, 2001, Dublin Ireland), and on the multi-artist compilation The Best of Rock and Roll Hall of Fame + Museum Live from U2’s induction in 2005. The song also features on both the Vertigo 2005: Live from Chicago and Popmart: Live from Mexico City DVD releases (there is no separate audio release for these titles). A live performance (June 15, 1986) from The Conspiracy of Hope Tour is included on the DVD portion of The Unforgettable Fire super deluxe reissue. The song was also part of the U2 3D theatrical release, filmed in South America in 2005, and was performed as part of the inauguration of President Obama in 2009, later released on DVD as The Official Inaugural Celebration. In 2011, members of the U2 Fan Club were given the opportunity to vote on 46 live tracks recorded during The U2360° Tour, with the top 22 songs to be included on a live album, U22. “Pride” was one of these choices. In the end, however, the song did not receive enough votes to appear on the final live compilation. The following year, the Edge picked his favorite tracks from the remaining 46 live tracks, and once again the track was not chosen for inclusion on From the Ground Up: Edge’s Picks. The August 3, 2009 version recorded in Gelsenkirchen, Germany, however, was released as a bonus digital download. In 2012, Bono re-recorded “Pride (In the Name of Love)” with DJ and producer, Tiësto, and it was released on a digital only release titled “Dance (RED), Save Lives”. The song featured samples of the original U2 track as well. In this newly recorded version, Bono finally went back and fixed his error in the original lyrics and sings “early evening April 4”, instead of “early morning April 4”. Produced by Brian Eno and Daniel Lanois. Additional engineering by Kevin Killen.